My sister gave me and my ex-husband this darling copper mailbox for our first wedding anniversary, back in 1990. 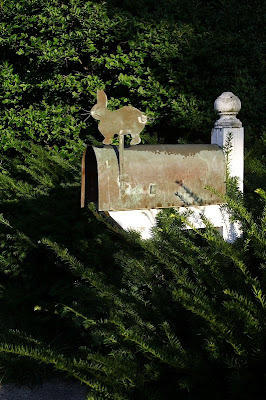 I've moved it from house to house, and think it will probably be my only mailbox ever. The door fell off long ago. The post finial is off something in my last house, I just screwed it - well, my NEIGHBOR screwed it - into the top of the post, when he saw me struggling with the power screwdriver. The hedges could use some serious trimming.